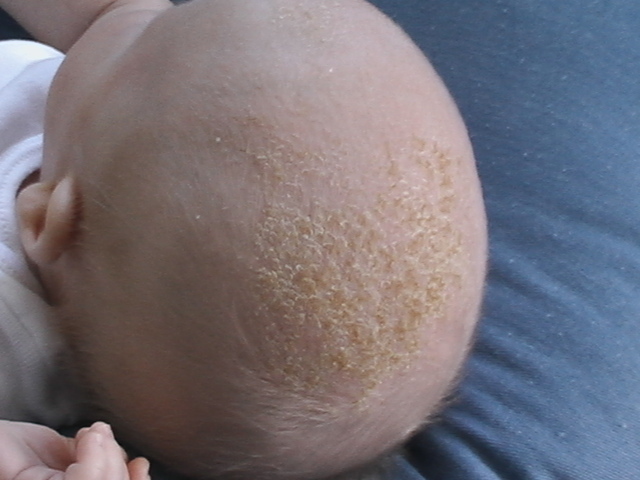 Cradle cap is a condition where a crusty yellow/brown deposit or flaky dandruff like deposits are seen on baby's scalp. It can occur anywhere on scalp, near ears or eye lids. It is not a good sight to look at, especially if in considerable quantity. However please note, Cradle Cap is one of the most common problems faced by babies, with almost half of all babies affected to some extent. My tweety had a head full of hair since birth, and although we could see some deposits on her scalp around forehead, we really came to know the size of her cradle cap after we got her the first haircut. She had a big patch starting the center of her scalp till an inch from forehead. This was in part responsible for the cut that tweety got with the razor. The patch was almost dark brown in color and thick around center of scalp with reducing thickness towards front. We were scared to see it and first reaction was to call our doctor. Our worries were put to rest by our doctor and subsequent search which tells that Cradle Cap generally does not bother the child, is non contagious and goes away on its own by the time baby turns 1. Doctors generally advise not to try removing the cradle cap by hard scratching as it may lead to a rash if the deposits is firmly sticking to the scalp. In case you feel the patch is too thick or is causing itching to baby, please consult your doctor. You may be prescribed a medicated anti dandruff shampoo to loosen up the deposits. There are a lot of home remedies, to remove cradle cap, most of which include applying oil (we used coconut oil) on baby's head, leaving it for half hour and then gently rubbing with fingers or a soft bristle toothbrush. We used our fingres to rub the scalp as with toothbrush we might unknowingly apply too much pressure. For babies with good amount of hair and cradle cap together, a way to reduce deposits could be to gently comb the hair back and forth a few times daily with a soft brush. We took this process of cradle cap removal very slowly and most of it went away on its own over a span of two weeks. We applied the oil method last week to hasten the removal of rather sticky part. Now over 90% of the deposit is gone and a minor part remains which I am hoping would go away over next one month. Do share if you experienced this with your child, your remedy might help others to cure cradle cap safely for their baby. with large number of methods for treating cradle cap assuring no adverse effects of the treatment.